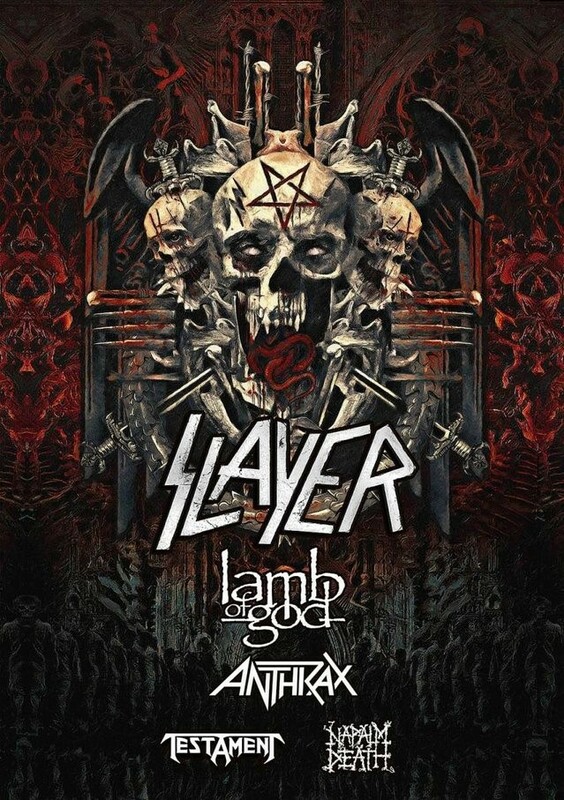 SLAYER – 2nd North American leg announced! for its final world tour! Literally by popular demand – with more than half the tour dates already either completely sold out or a sell-out imminent – today SLAYER announces leg two, North America, of its final world tour, set to kick off on Thursday, July 26 at the Bank of New Hampshire Pavilion in Gilford, NH. The tour will travel to 20 cities over about five weeks, culminating at San Jose, CA’s SAP Center on August 26. LAMB OF GOD, ANTHRAX, TESTAMENT and NAPALM DEATH will accompany the band on all dates. The general ticket on-sale for most dates begins this Friday, March 9 at 10AM (local). Very limited SLAYER onstage + meet & greet + exclusive merchandise packages will be available. Log on to www.slayer.net for all ticket and package purchasing information. A second North American leg for this tour had been considered to take place at some point down the line, but within 48-hours of the initial January 26 ticket on-sale date, that all changed.